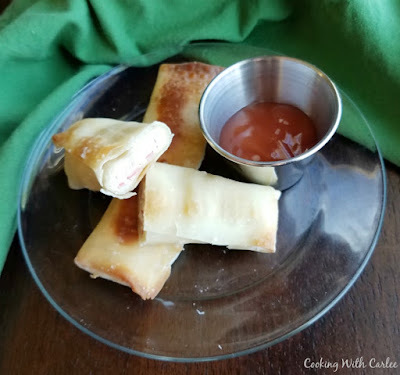 Enjoy the flavor of crab rangoon at home in a fun egg roll package, easily crisped in the oven! They are fun to make and perfect for parties. But there is something about crab rangoon that tempt me. Thinking about getting a takeout container of stir-fry, rice and steaming hot crab rangoon is making it tempting. Luckily we don't have to wait for delivery to get the flavor! We have made crab rangoon in wonton wrappers in a variety of shapes before, but I really love these egg roll shaped ones. They are easier to eat, don't have the overly crispy edges that other folds can get and are easy to make. I tend to avoid frying, but that doesn't stop me either. These crisp up nicely in the oven and give way to a soft interior. Grab and little sweet and sour sauce and you're in business! So here is a little something to ring in the Chinese New Year or a fun appetizer for a party! They are a tasty little snack that comes as close to the yummy ones you can order without the fryer. So grab yourself a pack of egg roll wrappers and get to work! Stir together cream cheese and spices until completely mixed. Fold in green onions and crab meat. 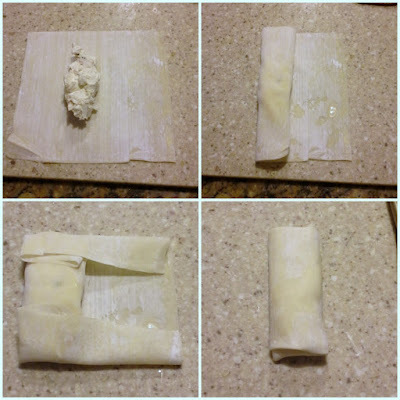 Place about 2 tablespoons of filling on an egg roll wrapper. Dip a finger in some water and wet the edge of the wrapper to seal. 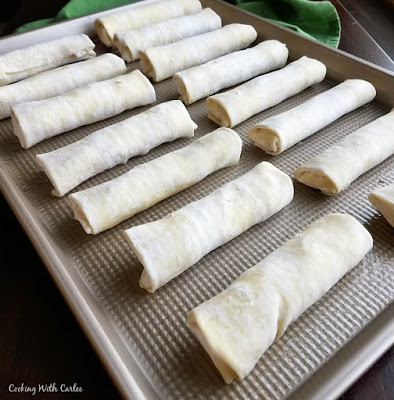 Once all egg rolls are ready, spray them all with a light coating of cooking spray. Bake in a 425 F oven for 10 minutes, flip then cook another 8 minutes. Be careful, they are hot! Enjoy crab rangoon egg rolls and MiMi's pork fried rice! I hope you enjoy them! Thanks for stopping by. They are easy! 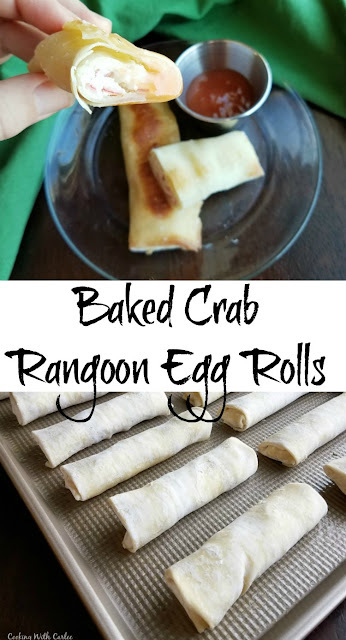 Baking rather than frying them makes it a lot easier than the traditional crab ragoon, but they still get a crunch! I am glad you like them! We really enjoyed them as well. Have a wonderful day! We love egg rolls around here. What a keeper, another great lil app for Football games!! ;-) Happy Wednesday beautiful! Yummy! I love that you can bake these! I am sheepish about frying, so it is the only way to go in my book! Thanks, Val! We love crab ragoon but hate the frying. I love the egg roll style - it's perfect! YUM! I feel the exact same way! They still get a nice crisp exterior without the mess! Thank you! Hi Carlee, this looks and sounds good. I have no idea what crab rangoon is, but love spring rolls and crab so I'm guessing I would love these. I much prefer baking that frying too. They are a little fried appetizer they serve at Chinese restaurants here. My guess is they are not at all authentic Chinese cuisine, but delicious anyway! These egg rolls look delicious. I love that they are baked. I bet they were fun to make. Perfect for game day! Baking them is so much easier and less messy than frying and they still get a nice crisp exterior! Thank you!! I never new what a crab rangoon was until now! Love this recipe! Thanks for sharing at Friday Frenzy Link Party! PINNED! Oh my goodness! They are a Chinese restaurant staple around here! 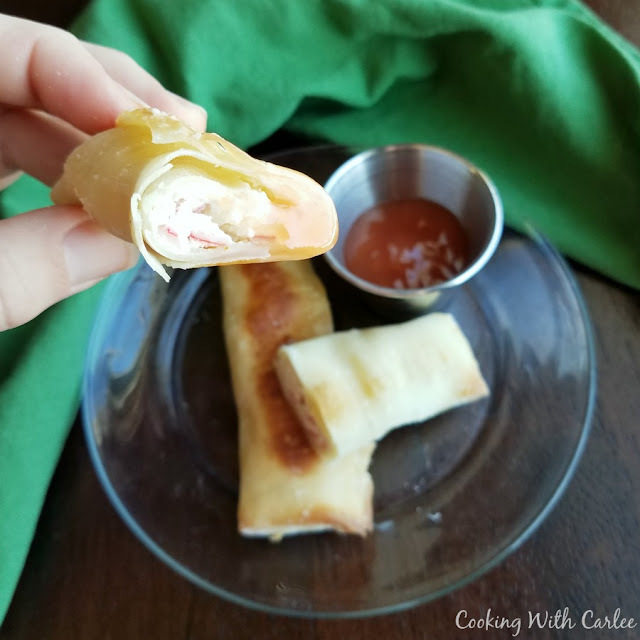 Your Baked Crab Ragoon Egg Rolls look fantastic! Happy to see you here at Full Plate Thursday and thanks so much for sharing with us. How yummy! Can't wait to try these. Thank you for sharing on Merry Monday! Hope to see ya next week!